Do you know that 98% of POS providers are taking your cash for forever? Magestore only asks you for once to own a strong POS with free update. Today’s point-of-sale (POS) systems are not just cash registers anymore. We are in an era of new technologies like mobile devices and PWA. POS systems still include both software and hardware components, but they now also offer many new functions as well. One of these functions are the synergies created by integrating them with other back-end applications such as Magento and inventory management. The cloud tech is truly necessary to increase the data visibility with an internet connection, also it helps increase the data security and streamline information management across multiple locations. But are these benefits truly needed in Magento platform? You know, Magento is pretty accurate in syncing data online to offline. As an Ecommerce platform, Magento is secured at its core, with a great Security Center to backup your Magento sites. Knowing the core benefits of Magento, many extension providers and Magento partners are working on delivering POS extension. But none of them reaches the desired level that one bigger enterprise needs. That’s why we work hard to close the gap of built-in Magento POS extension with cloud-based POS, while keeping the amazing one-time payment. The latest update (19/2/2019) version of Magento is Magento 2.3. A powerful and completely different version which will change the way you work. It empowers users with better management in selling on multiple channels. Needless to say, Multi-source Inventory (MSI) feature is one of the hottest topics in Magento community. Retailers now can control inventory effectively to fulfill for different sales channels. With all order and inventory info in 01 place, stock control is easier and produces fewer mistakes. Google reCAPTCHA and Two Factor Authentication: protect against malicious attempts including spam and abuse. Let’s face it, you are having a real deal business, with growing development and lots of data to take care of. And who gonna do all these tasks by hand? You? Well, no. Please don’t do that. The less manual, the better. If you try to do everything manually, you need more time. Also, you increase the high chance of mistakes, which costs you even more time & cost to fix later. Again, we must repeat: automation cures your business (& your life too!). Great question. 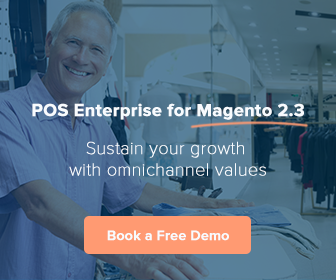 If you’ve already used a native Magento POS for your website, you may concern if it is working again in this new Magento 2.3 or not. And if the answer is “no”, then which is a great alternative? There are a lot of benefits for using a native Magento POS, such as real-time and automatic sync data (yes, 100% automatic sync!). Since data from your POS goes directly to your Magento backend, not through any 3rd party, you don’t need to pay more for a handy report, or find anything you need in another page. Magento native extensions also give the best security for your website, without any phishing or compromise. No effort wasted, no problem raised. Moreover, the built-in MSI (Multi Source Inventory) of Magento 2.3 is a highlight feature, especially for those selling on multi-channels. Although the release of MSI helps retailers control inventory of each sales channel separately and more easily. There are rooms to boost efficiency. I suggest barcode as one add-on to simplify stock control. There are many extensions for Magento 2.3 that generate barcodes & optimize the layout for printing. With a barcode scanner, it takes much less time and effort to find the product you need. If you don’t know the difference between a cloud-based and native POS it’s fairly easy to explain. A native POS is the classic Magento POS extension, which needs Magento backend to work. It is native, as its name implies. A could-based POS system is most often operated from an iPad with an attachment to swipe your credit-card. There are a few obvious differences, but here are the main pros and cons you should consider when looking at cloud vs native. Cloud POS systems are the new thing, and you’ve probably seen them popping up around small stores near you. However that’s one thing you need to be careful of, they are more fitted for small stores than large. 3, You need to find the trustworthy Magento partner. Why you should have a POS system? With these outstanding features above, you can easily see that using POS system have a highly positive effect on your business. All business data, including sales, customer information, inventory, staff, loyalty programs, etc. will be centralized in the same place. In anywhere and anytime, you can track quickly which products you have sold, how many products are there in the warehouse, and vitally, how much your store earned daily, monthly or annually. The system helps you make accurate reports with basic analysis, such as which product is the best-sold and the tendency of sale. You can save time entering the number and make reports. Instead, you can create the best plan for your business growth. All customer details POS system gathered are very valuable for generating personal offers and developing personal client communication. Based on this information, you can create suitable loyalty programs which are not only personalized but also interesting to your customers. All reports about the bills, orders, sales, customers, etc. are released quickly and accurately. Your company can save time on paperwork. Your employees do not need to repeat entering Qty. in every single channel. Even better, you do not need to hire too many staffs. Without a POS System, your customers will have to stand in a long line to wait for their checkout turn. However, with POS System, you can easily check products with a barcode scanner, automatically calculate taxes with software, quickly printing bills or sending them a receipt message.